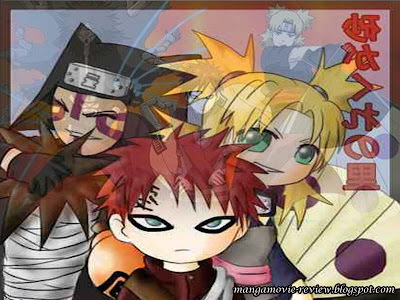 One team on Naruto Shippuuden that I or maybe all of us Narutofan are missing so much their action "The Sand Siblings" with Gaara, Temari and Kankuro in one team. We could see their last appeared on Naruto Shippuuden episode 32, its tell about Gaara and the others when they came back to the sand village after long fighted with Akatsuki. 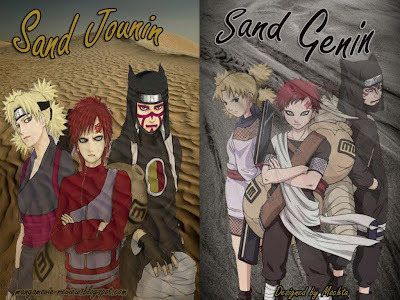 It looked like the top story of Gaara, Temari and Kankuro or I called that Team Sand was closed. But I really hope, they will be appeared again with new strength and new mission on the next episode. I miss your action guys, even Gaara wasn't Jinchuuriiki anymore I still believe with his power, as talented ninja its not difficult for him to get new strength, then Temari with her relationship with Shikamaru is very interested to be followed and Kankuro, I want to know him has been passed Sasori abilities as new puppet master from the sand village. As a team, never underestimate their power. Would be like what if they are appear again? To refresh your memories about their change from Genin to Jounin, see their picture below. Why did I hope they would be appeared again? As we know, their first appeared on Naruto story as the enemies but then they have totally changed became Naruto's friends, very closer friends. So I thought their characters are very unique. Its so difficult to imagine Gaara, Temari and Kankuro appear as silly, stupid and funny characters. But as a bonus you could take this one if you wanna be able to imagine team sand with that characters. Thanks for your visiting Ruth, It would be nice to see you again. 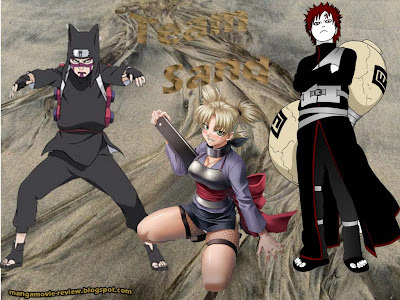 im late here,as now team sand had appear when 5kages meeting in samurai village..and they fight with hebi team..